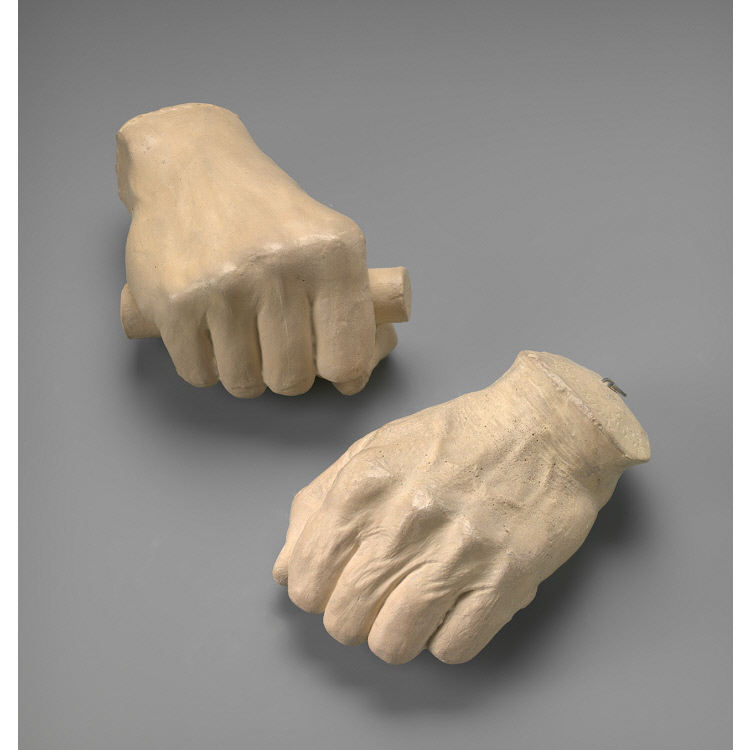 Soon after Abraham Lincoln won the Republican presidential nomination, in May of 1860, sculptor Leonard Wells Volk made casts of Lincoln’s hands. The right hand is shown grasping a sawed-off section of a broom handle, which Lincoln obligingly fetched from a shed when the artist suggested that he hold on to something. Lincoln smoothed the edges of the wood, reportedly saying, “I thought I would like to have it nice.” During their session, Volk was already thinking of using these casts, in combination with his recently completed Lincoln bust, to fashion a full-length statue. Poco después de que Abraham Lincoln obtuviera la nominación a la presidencia por el Partido Republicano, en mayo de 1860, el escultor Leonard Wells Volk hizo moldes de sus manos. La mano derecha aparece agarrando un trozo del mango de una escoba que Lincoln tuvo la gentileza de buscar en un cobertizo cuando el artista sugirió que sujetara algo. Cuando Lincoln empezó a lijar los bordes del trozo de madera, Lincoln contestó: “Pensé que me gustaría más pulido”. Ya durante la sesión Volk estaba planeando utilizar estos moldes, en combinación con el busto de Lincoln recién terminado, para construer una estatua de cuerpo entero.